Rick walks into his classroom, and he is angry. He throws his backpack across the classroom while yelling that he is going to “mess up” Jeremy because Jeremy played his music too loudly on the bus. His classmates look at him with fear in their eyes, and Twyla asks her teacher if Rick is going to hurt them. Rick turns to her and tells her to “shut up.” The teacher quickly separates Rick’s peers from him and waits for him to calm down. After about 10 minutes, he is calm and settling into his morning routine. Rick’s peers return to the classroom and their teacher begins the lesson. When she asks the children to take out their homework, Rick begins rooting through his backpack and can’t find his. He tells the teacher that he did it last night but forgot to put it in his backpack. Rick gets through the morning with no further outbursts and transitions from classroom to the lunchroom with no problem. He enjoys lunch because he sits with students who are a grade above him. Rick likes associating with older students because he thinks they are “cool.” The older students usually don’t pay a lot of attention to Rick, because he doesn’t initiate conversation with them appropriately and he sometimes engages in attention-seeking behavior in an effort to be funny. Today he sat down with these students and immediately started talking about his upcoming “DJ gig” at the YMCA. The students at the table glance in his direction and say to him, “Oh, right on dude,” and then resume their conversation. Rick continues to talk about his gig; meanwhile the other students finish their lunch, clean up, and walk out of the lunchroom. Rick continues his afternoon routine until it is time to go home. When he finds out the bus will be a few minutes late, he becomes angry because he is going to miss the first few minutes of his favorite TV show. Someone who is unfamiliar with individuals who have autism may be puzzled by his behavior and think he is just “acting out.” However, the behaviors he exhibits are most likely due to poor executive functioning. Executive functions are the skills everyone uses to organize and act on information. Individuals with autism spectrum disorder (ASD) often have poor executive functioning and may struggle with the following skills: impulse control, emotional control, flexible thinking, working memory, self-monitoring, planning and prioritizing, task initiation, and organization. 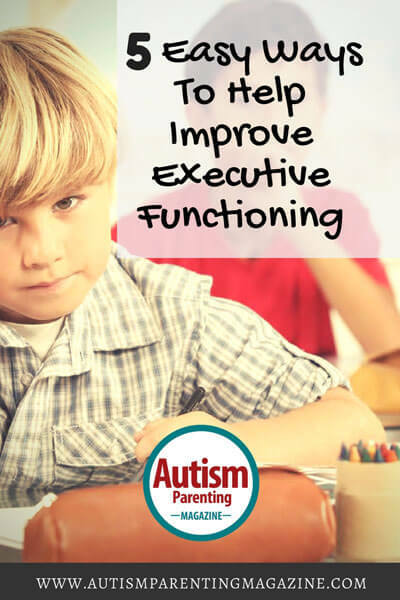 The inappropriate reactions and behaviors Rick exhibited at school can be understood in terms of his deficits in executive functioning. The five tips we give for this month’s Social Skills Corner focus on how you can help your child improve executive functioning. These strategies may help to improve academic performance as well as lessen the chance of having an outburst or alienating peers. We are suggesting various strategies for children of different ages. Teaching children simple relaxation techniques can be very effective in managing impulses and controlling emotions. Your child needs to learn to recognize when he is starting to lose control and then implement these techniques before the situation gets out of hand. In order to help your child use calming techniques, you can take a picture of him posing with an “upset” face and an “angry” face. Next to each face, write calming strategies or ways of seeking help that he can use when he starts to feel this way. At home, you can practice using the card and the techniques. Relaxation techniques can include taking deep breaths or counting to 10. In addition to relaxation techniques, he may benefit from learning to walk away from a person who is making him angry, or asking a teacher for help. If you know what may trigger an outburst (such as loud music on the bus), talk with the bus driver and/or teacher about what realistic modifications can be made to help your child maintain control. This may be as simple as wearing headphones to listen to his own music, or posting the card with your child’s calming strategies on the bus seat and at his desk. You can show your child how to be flexible by showing him how things can change, saying it is “no big deal.” You can illustrate this by taking an ordinary object, like a funnel, and turning it into a party hat, trumpet, or unicorn. You can read the book Amelia Bedelia, where the heroine takes everything literally. You and your child can talk about what Amelia can do differently in each situation she is presented. Finally, you can make up new rules to games, such as having players slide down ladders and walk up slides in Chutes and Ladders, or putting the bases in reverse order in kickball. You can also make very small changes in your child’s daily routine to help him learn to deal with unexpected changes.Give your child scripted phrases to use, such as “no big deal” or “zigger-zagger,” to let him know that change is OK. Share these phrases with the teacher so that she can also use them with your child. If you child has difficulty with working memory, you can build this skill by having your child teach you the steps of a task, showing your child how to use a graphic organizer, or teaching her fun mnemonics like Roy G. Biv to remember the colors in the rainbow. You can also use multisensory strategies to help your child retain information by writing down what needs to be done, having her repeat it, and then tossing a ball back and forth while repeating the information a third time. This may sound like a lot to do, but it is fun and may keep her from becoming frustrated because she can’t remember what she has been asked to do. Share this with her teacher to make work assignments less frustrating. A variety of simple techniques can be used to help your child with organizational skills. You may want to teach him to use color-coded sticky notes to mark important pages in books and assignments, or use his smartphone to put important dates and daily reminder alarms. Visual checklists, backpacks with different colored pockets, caddies, and colored pocket folders are often helpful. Having a homework assignment notebook that the teacher can check at the end of the day to make sure that all assignments are listed and that you can then check at home is also a very helpful technique. Self-monitoring can be accomplished by identifying a few specific behaviors your child can work on at home and school. For example, you may select “Say ‘hi’ to people when you walk into a room” and “Ask others how their day is.” Avoid vague behaviors such as “be good” and “be nice.” Write these behaviors on a card that your child can carry. When opportunities come up for your child to exhibit the behavior, ask her if she did what was on the card. If she did, give her a high-five. If not, gently remind her what she should try to remember to do. Share this with your child’s teachers so they can follow through at school. We hope these tips will be helpful as the upcoming school year approaches. Although executive functioning skills can be difficult to learn, by addressing them with your child these tips should aid in fostering a happy and less stressful school year. Dr. Carter is a clinical psychologist. Ms. O’Shaughnessy is a psychology associate. They are co-authors of PREP for Social Success: A Guide for Parents of Children with Autism. It is a social skills manual which provides an easy to follow four step program to help your child improve social functioning and emotion management. It is available exclusively through Amazon Kindle at http://www.amazon.com/gp/product/B00WQANRI4. You can follow them on Twitter @Prep4SocSuccess and on Facebook at https://www.facebook.com/PREPforSocialSuccess. Dr. Jamie E. Carter is a clinical psychologist. Ahna I. O’Shaughnessy is a psychology associate. They are co-authors of PREP for Social Success: A Guide for Parents of Children with Autism. It is a social skills manual that provides an easy-to-follow, four step program to help your child improve social functioning and emotion management. It is available exclusively through Amazon Kindle at http://www.amazon.com/gp/product/B00WQANRI4 and can be downloaded to a Kindle device, a tablet, or a computer. How do you get a 21 yr old who has Aspergers Syndrome to answer you properly instead of saying ‘E ‘ elongating the vowel ! Or he will make what I can only describe it as an Autistic noise! He can converse quite inteligently but I suspect its on his terms and on his tunnel vision subjext it is very frustraiting when you ask a person a question an they come back at you with Eeeeeeeeeeee ! In some respect intellectually he is at his chronological age but emotionally and psychologigically he is well below his chronological age and sometimes you think its of a toddler level and not of a 21 yr old young man. Your help on this topic would dearly be appreciated I live in the Uk.